Backcourt violations are among the most misunderstood in basketball. Many players know that they must advance the ball from the backcourt to the frontcourt in a specific period of time, but few know what specifically constitutes a backcourt violation. Teams that can't control the ball in the backcourt regularly end up having a problem competing for a full basketball game. A basketball player may not dribble the ball from the backcourt to the frontcourt and then return to the backcourt again. This is called an over-and-back violation. However, the dribbler has quite a bit of leeway when in the process of dribbling. The dribbler is not considered to be in the front court until both feet and the basketball are in the front court. If the dribbler has one foot in the backcourt while the ball and the other foot are in the front court, the dribbler is still considered to be in the backcourt. However, once the dribbler has both feet and the ball in the front court, the ball must remain in the front court from that point forward. When a team gains possession of the ball in the backcourt after a made basket, a rebound, a steal or gaining a loose ball, it has 10 seconds to get across midcourt. 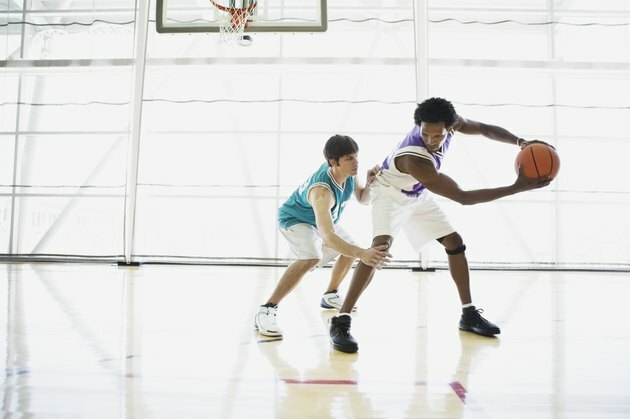 If the player in possession of the ball is not fully across the midcourt line by a count of 10, the opponent is awarded possession of the ball. Both feet and the ball must be across the midcourt line. If the defensive team kicks the ball in an attempt to gain possession, the team with the ball is awarded another eight seconds to get across the line. When the defensive team pressures the team with the ball, the ballhandler may feel significant pressure as the time clock ticks down toward the 10-second mark. If the ballhandler feels as though he may not cross the line in time, he will likely turn up court and charge ahead. If he makes contact with a defender during that process, the referee will call a player-control foul for charging on the ball-handler and the opposing team will be given possession of the ball.